The Bost Family: Our Weekend!! My camera broke. My brand new camera broke. Of course when I told Jonathan that something was wrong with my camera he asked "what did you do to it?" and "did you drop it?". For your information I DID NOT DROP IT!! Usually these are valid questions because I'm a little clumsy, but this time it wasn't my fault! Anyway, we are sending it in to be repaired, a row of pixels went out on the screen so it can easily be fixed. Hopefully quickly... Anyway, so no pictures of the Lucy Bear for a while. I hate to blog without pictures so I will leave you with this. My favorite TV family. This is what I've been doing this weekend. 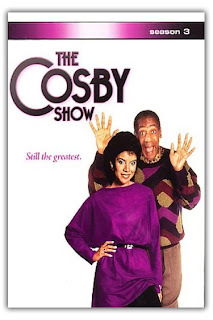 Watching a little Cosby. We have also been watching "Challenge" on the Food Network. If you haven't watched it you need to. They make these awesome building, dresses, sculptures and other things all out of chocolate!! I am so sorry to hear about your camera Lucy. I hope your mom and dad hurry to get it fixed because I am really going to miss seeing pictures of you every few days. I had to go back and look at old posts to get my Lucy fix. But by Friday!!!! I get to see the real girl and I can hardly wait! Tell your Aunt Laura that you can always plan to stop off in Arkadelphia on your way to Baton Rouge. I think it's just about half way! Joh and I watched the chocolate challenge too! Amazing stuff! My favorite was the 1200 pound chocolate lion! Get that camera fixed quick please! I will miss my daily Lucy pics. Becky - I would love to see you while you are in town. Let me know if you get a free minute!